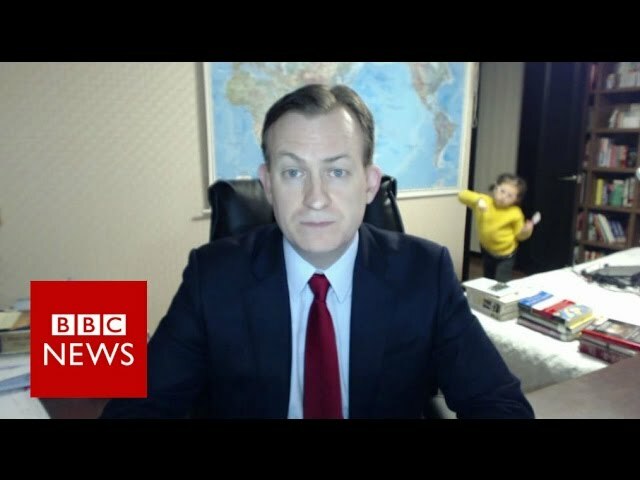 We've all seen the "BBC Dad" video by now. A distinguished professor is discussing the finer points of South Korea's political upheaval over video teleconferencing. His adorable kids charge in, while their mom desperately attempts to minimize the interruption and their dad quietly tries to compose himself. The viral interview serves as an unexpectedly hilarious clip and a wonderful reminder of the potential downfalls of remote work. With that in mind, it's a good opportunity to remind ourselves of what working remotely should ideally look like. Here are some best practices to follow in an effort to avoid those embarrassing moments — as cute as they may be. Imagine this scenario: You wake up from an incredibly restful night of sleep after hitting the snooze button a few times, and you're immediately faced with the day's first dilemma as a telecommuter. What to wear? As comfy as your PJs may be, traipsing around in clothes you wouldn't even wear to the grocery store may have some unforeseen consequences. An obvious shortcoming rears its ugly head when video teleconferencing enters the picture. Nothing breaks your concentration quite like the mad rush to find suitable clothes as your phone rings and you remember that 2 p.m. design session you had scheduled. Entering the call sweaty and out of breath doesn't help the situation, either. Yet there are more subtle reasons why making yourself presentable during remote hours is a good idea. First, dressing to impress instills an innate sense of professionalism, which helps persuade our minds that it's time to work, not play. Second, making a habit of actually getting ready for work rather than simply rolling out of bed and into your home office establishes beneficial routines. If you're already waking up early to dress the part, chances are you'll also take the time to hop in the shower or maybe read the morning news. Doing so gets your productivity humming before you even clock in. Traditional offices do an admirable job of helping you separate the distractions of your personal life from your work obligations. Really, outside of social media and the occasional phone call from your significant other, there's not much standing between you and a productive day at the office. Not so much so with a remote office. Much like we saw in the "BBC Dad" video, distractions can come all too easily when working remotely. It stands to reason, then, that establishing an area of your home for interruption-free work is a solid idea. Fortunately, the execution is simple and straightforward. Just like the dad in the video, find a quiet room that's separated from any shenanigans happening elsewhere in your home. Unlike the dad in the video, it might not be a bad idea to lock the door during televised meetings. Pro tip: Keep things like coffee and snacks handy in your fortress to avoid leaving the distraction-free zone. Finally, if you want to find success in a remote environment, connectivity is key. This means keeping a reliable connection to office resources no matter where you're working. Ideally, you should be available to work and communicate with the same ease as you would in an office setting, even if you're sitting at your local coffee shop. Taking advantage of cloud-based solutions is one of the best ways to ensure this high level of mobile connectivity. For example, on-demand, virtual video conferencing solutions allow you to connect any mobile device to your organization's existing teleconferencing resources. As such, you'll be able to reliably connect to meetings whether you're on the road, in the air, or in your fortress of solitude at home. Similar platforms exist for your workflow processes and give you the freedom to work productively anywhere in the world when used in combination with mobile communications platforms. In the end, working remotely boils down to preparation and willpower. Simply exercise some self-control, equip your mobile office accordingly, and you'll be able to weather any distraction — charming children or otherwise.